Need to fit a workout during your lunch break? 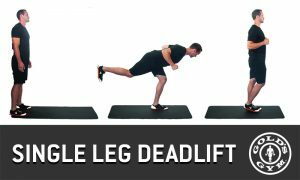 Try our 25 minute full-body and bodyweight workout. During the week, your days get busy. We get that. So we’ve created a quick and efficient 25-minute lunch break workout to make sure you can squeeze in a sweat session during your busy day. And the best part? You will feel refreshed and energized when you get back to your desk! From a standing position, bend over as if you’re going to touch your toes but place your hands flat on the ground in front of you. (Depending on your flexibility, you may need to slightly bend your knees or place your hands a few inches away from your feet.) 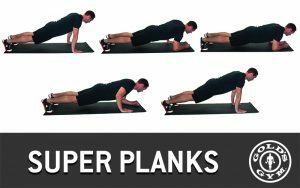 Slowly walk your hands forward until your body is in a plank position, hold for a couple of seconds and then slowly walk your feet forward to meet your hands, returning to the bent position. From a standing position with feet hip width apart, begin the exercise by taking a big step straight back and then lower your back knee toward the floor until both legs form a 90 degree angle at the knee. From here, twist your torso toward your front leg, and then back to neutral before you stand up and repeat for the opposite leg. Get in push-up position on all fours from either your knees or your toes depending on your comfort level. With hands directly below your shoulders and body straight, lower your body until your chest touches the floor while simultaneously lifting one leg up toward your arm as you lower. 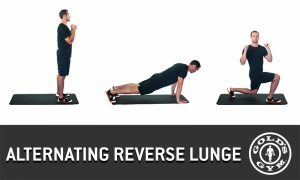 Press up from the floor until your arms are straight while returning your leg to the starting position before repeating for the next rep lifting the opposite leg this time. Stand with feet shoulder-width apart, keeping a dumbbell on the floor between your legs. Choose a dumbbell weight that is challenging but doable. Squat down and lift the dumbbell off the floor with both hands. Move from the squat position to a standing position, then return to the squat and touch the dumbbell to the floor. Begin standing with feet together and arms by your side. Jump up and out to the side with both feet so that your feet are now wide apart. While jumping out, raise your arms straight up and out to your side until your palms are together above your head. Jump your feet back together as you return your arms to your side and you’ve completed 1 rep.
From a push-up position on hands and toes, lift one arm up off of the floor and touch the opposite shoulder. Be very conscious of your movement and focus on moving only the arm, resist shifting your hips or torso to compensate when you lift your arm up. 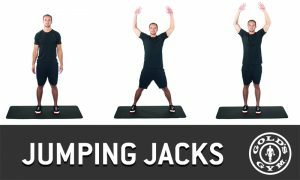 Ready to try our 25-Minute Lunch Break Full-Body Workout? Save our printable version of the workout.